"Don’t Call Me Angel opens with its title track, one of the album’s best songs. This is a beautiful song that features some excellent lyrics"...."On “Make It Right,” Hilary Scott delivers a gorgeous vocal performance that has an intimate feel at first and then builds from there"...and much more! 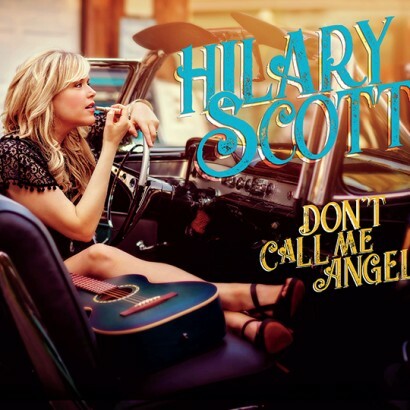 Michael Doherty reviews Hilary Scott’s new album, Don’t Call Me Angel. A copy of the review is below. You can check it out on Michael Doherty’s Music Log, along with reviews of other great music! “Hilary Scott is a singer and songwriter working largely in the country and folk realm. Her newest release, Don’t Call Me Angel, however, has a good deal of soul added to her sound. This album contains mostly original material, written by Hilary Scott, songs that are emotionally engaging. Hilary Scott plays piano, acoustic guitar and ukulele on this release. Joining her are AJ Gennaro on drums and percussion; Josh Schilling on bass, electric guitar and ukulele; Johnny Lee Schell on guitar and mandolin; and Mike Finnigan on organ. Don’t Call Me Angel opens with its title track, one of the album’s best songs. This is a beautiful song that features some excellent lyrics, such as these lines: “I’ve got more than dust on me/And plenty mistakes to my name.” Those are the lines that immediately stood out and pulled me in. “Don’t call me angel…I never looked good in white.” That’s followed by “Not Used To Being Used To,” which has quite a different feel right from the start with the piano and the finger snaps. There is a lot of soul to Hilary’s vocal performance here, and a joy to her blues. “I’m not used to being used to being treated so well/Honey, you took my hand and led me straight out of hell.” This is a really strong track. On “Make It Right,” Hilary Scott delivers a gorgeous vocal performance that has an intimate feel at first and then builds from there. Check out these lines: “You know how to make it painless when you hit the ground/You know when it’s just not worth the fight/You know how to do wrong and make it right.” Not bad, eh? This song also features some nice work on keys, and is one of my favorites of the album. “Heartless” also has an intimate vibe and builds to become a powerful song. These are the lines that open this one: “I washed most of my makeup clean/Just a few lipstick stains/And though now it’s just plain old me/A bit of you still remains.” But perhaps my favorite lines are these: “You brought me a paper bouquet/And it won’t die, but the colors will fade.” This track also features more good stuff on keys. Don’t Call Me Angel was released on October 12, 2018 on Belltown Records.